UPDATE - June 28, 2011 - Apparently, the trail is being upgraded to a road. They will be putting down four acres of asphalt, taking out hundreds of trees and tons of salal and other plants. If you want to enjoy a wilderness experience in a natural environment, you should make a point of visiting this trail soon. The new trail will be much more urban, modeled on the Burke-Gilman Trail in Seattle. UPDATE - July 23, 2010 - The park service is seriously considering turning this trail into an alternate transportation corridor, a twelve foot wide, partially paved road for use by bicyclists. That's as wide as the alternate transportation corridor that runs over the Brooklyn Bridge, but that pathway is more hiker friendly as it is half for bikers and half for hikers, but the new Spruce Transportation Corridor will be 75% for bikers and leave 25% for hikers, joggers, equestrians (and their horses). Of course, the Brooklyn Bridge is a magnificent urban amenity, while the Spruce Railroad Trail is supposedly in a national park. For more info on the plans to eliminate this trail as a hiking, jogging and horseback trail, see the Olympic National Park website. UPDATE - February 10, 2005 - There was a lot of wind and snow damage to the trees along this trail. We neatened things up a bit, but it is still rather rough going. The Spruce Railroad Trail is a monument to the early aviation industry and triumph of the more recent rails to trails movement. This beautiful trail which runs along the north shore of Lake Crescent was once the railroad that brought the light weight spruce wood from the North Olympic Peninsula to Boeing in Seattle, and may have carried the spruce used in Howard Hugh's infamous "spruce goose", the largest wooden airplane ever built. So much for industrial history. The trail is now a relatively flat, easy trail that offers a pleasant forest walk with more or less continuous views of a beautiful lake. 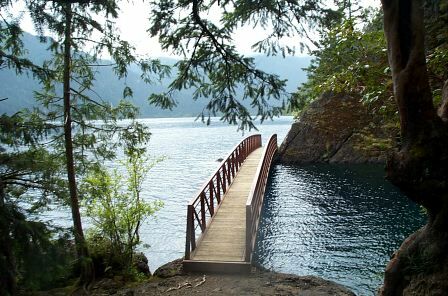 As an additional bonus, you can swim in Lake Crescent along the trail, and it is a good trail for bikers, serving as an alternate bicycle route. Take route 101 west from Port Angeles. Head past the Elwha turn off and keep heading west. When you see a Texaco station on your right, possibly the last gas station before Sappho, start watching for the Log Cabin Resort / Spruce Railroad turnoff on your right. Take that right turn and follow the road, past where it narrows, for about three miles. When you see the Log Cabin Resort on your left, start watching for the Spruce Railroad Trail turnoff perhaps a quarter of a mile further on, also on the left. Take that turnoff and continue for about another mile to the well marked trailhead. Lake Crescent Cottage will be available for weekly rental starting in July 2004. It is right by the lake, and sleeps five in three bedrooms. Check the website for more information. This trail is generally easy going, but it starts out with a climb past an old apple tree and a field full of evil horsetail ferns. The trail joins the old railbed and presently descends to follow the lake shore. It can be a bit muddy here during the rainy season, so watch your step. Also, keep an eye open for rust colored Olympic salamanders who are common here when it is wet enough. This is a local species and only found on the peninsula. After some level going, the trail climbs again, but not very far, just enough to get around one of the rocky headlands. There is a railroad tunnel through it, and you might be able to explore it, but there is a better, more accessible tunnel to poke around in further down the trail. After this rocky headland comes the bridge. Not everything around here is natural. Remember, this is a railbed and the only reason there is a trail here is because a bunch of railroad engineers and teams of workmen moved tons of dirt. If you pay attention, you can see old pilings and retaining walls, but the real attraction is the lake itself. The bridge, which is about a mile from the trailhead is also a good place to go swimming. The little lagoon is sheltered and it is easy to clamber down the rocks into the water. If it is too crowded here, head on down a bit farther, where there is also good water access. The trail continues from here and the lake runs along beside you like a diorama. On sunny days, the lake water can be a rich, milky blue that we call atomic pool blue. It looks just like the glow of Cerenkov radiation in an atomic waste holding pool. The blue here is from melted glaciers and as best as we can tell it is not radioactive. 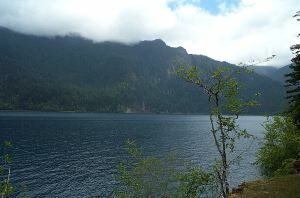 Across the lake, you can see Mount Storm King and the Lake Crescent Lodge and visitor center. Watch your step when you pass the salal ground cover, there are mountain beavers hiding in there and one of us nearly tripped over one. There is a second headland a mile or two after the bridge and the trail detours from the railbed. The railroad took a tunnel, which you can explore, but it looks awfully dark and dangerous, so do so at your own risk. The trail ends maybe a mile after this. There is a last rail from the railroad here and another parking lot. This is an easy trail, so all we can suggest is mud shoes in season and take water with you. You might also take your bathing suit. We have heard that there are ticks here, so take precautions. If you go swimming, have some long pants you can put on. If you find out that the water really is radioactive, do send Mail to the Kale and let us know so we can get chelated or whatever.